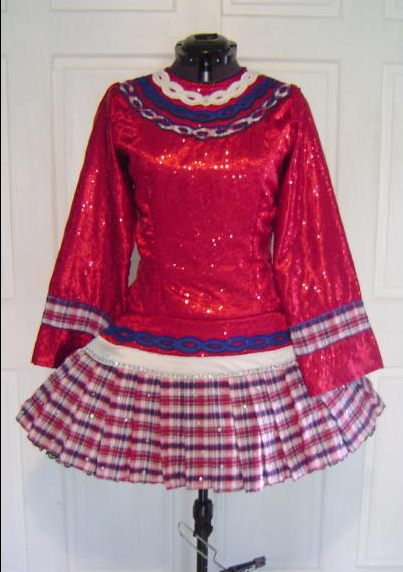 Lovely red, white and blue dress with plaid skirt and accents. The dress is very lightweight and comfortable to dance in. The dress is very sparkly and has great stage presence, with a sequined bodice and sleeves and over 800 AB rhinestones. Fully lined in satin. The dress has only been worn a handful of times by one dancer. I am selling the dress because I am no longer dancing. It is in great condition and this was by far my favorite dress! I am willing to take the best and quickest offer on this dress! Please email nels7685@umn.edu for more information. Asking Price: $US525 OBO. Shipping costs are not included in the asking price. Sale is final.